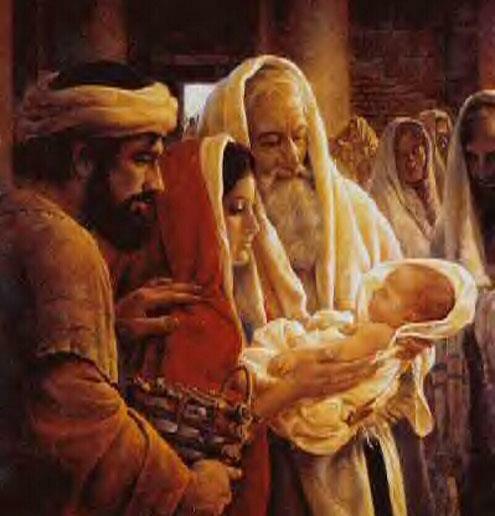 Joseph and Mary presented Jesus to His Heavenly Father in the Temple of Jerusalem forty days after His birth. There was a devout man in Jerusalem called Simeon, waiting in the Temple. He was blessed by the Holy Spirit, took Baby Jesus in his arms with joy. On this presentation God received a much more glory than He had ever received in the temple from all the sacrifices of the Old Testament. On this day it is His own Son Jesus Who is offered to Him, and Who offers to the Father the unlimited honor of worship, thanksgiving and supplication. It is from the hands of the Virgin Mary, full of grace, that this offering, so pleasing to God, is received. For Mary is perfect, filled with the wisdom of the Holy Spirit. Mary had given her consent to offer her Son Jesus to the Father as a sacrifice for the whole world. For she knows that her Son is "The King of Glory". 25 Now there was a man in Jerusalem called Simeon, who was righteous and devout. He was waiting for the consolation of Israel, and the Holy Spirit was on him. 26 It had been revealed to him by the Holy Spirit that he would not die before he had seen the Lord’s Messiah.